The Flash's 100th episode officially airs tonight, and it's a serious blast from the past as Barry (Grant Gustin) and his daughter Nora (Jessica Parker Kennedy) take a time travel journey back through some of the show's most major moments, revisiting some big bads and big twists. 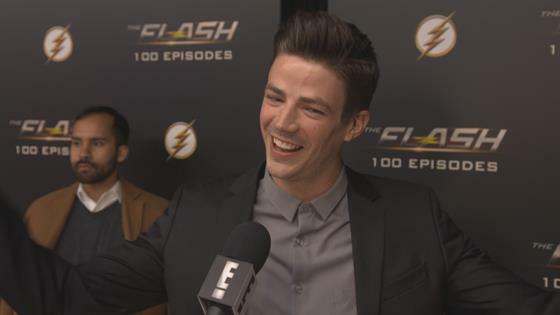 We'll have some scoop from the cast after the episode for what it all means for the rest of the season, but for now, Gustin and Candice Patton are taking a look back at 100 episodes and taking it all in. "Woo! I survived!" Patton said during the 100th episode celebration. "When I stop and think about it, it is a reallys pecial thing. I know not every show, not every actor gets to have this experience and that's something I'm extremely grateful for, and no matter what happens in my career, I have this moment, and that's really really cool." 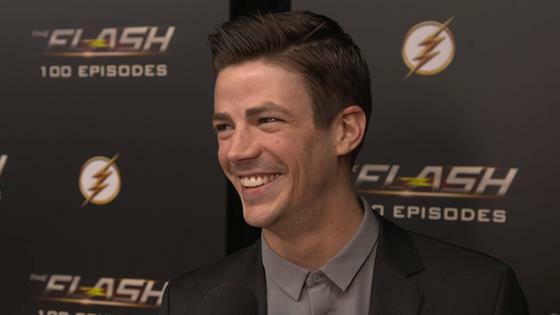 Gustin says the number really hit him two years ago when they were celebrating Arrow's 100th episode (which we were also in attendance for). "That's more when the concept of it kind of blew my mind a little bit more, because I was so far away from reaching that, and I know how hard it is to make these shows. It's crazy. It feels like we've made a hundred. It's cool. It's a cool feeling." Season one introduced us to Barry Allen, the slightly nerdy CSI tech who got struck by lightning during the particle accelerator explosion at STAR Labs. He then developed super speed and became the Flash. We also met the wheelchair-bound Harrison Wells, who was not actually Harrison Wells and didn't actually need a wheelchair. He was actually Eobard Thawne, a rogue speedster, and he had gone back in time and killed Barry's mother. Season two was all about Zoom, another evil speedster, who wanted to steal Barry's speed and was masquerading as the friendly Jay Garrick in the meantime. He did some pretty evil things like kidnapping Caitlin (Danielle Panabaker) and killing Henry (John Wesley Shipp), which led to Barry making a rather bad decision at the end of the season to go back in time and save his mother from Eobard Thawne. That decision created the world of Flashpoint, which opened season three. It wasn't good for anybody but Barry and his parents, so he went back and fixed it, but it didn't totally fix everything. It screwed up Iris' relationship with her dad and even messed up some lives on Arrow. Eventually, Barry met a metallic speedster named Savitar, and Savitar was going to kill Iris. Barry had even run to the future to witness this occurring, and no one could figure out a way to stop it from happening. Barry later learned that Savitar was actually a time remnant of his own future self, and that Iris had to die so that Savitar could exist. Iris didn't end up dying, but HR (the latest iteration of Wells) died while disguised as Iris. Barry then sacrificed himself to the Speed Force to save Central City. Season four opened with Barry still stuck inside the Speed Force, but the rest of the team worked to get him out. When he returned, he was speaking gibberish, writing random symbols that translated to things like "this house is bitchin'." Part of the season was spent tracking down "bus metas," who had been turned into metas on purpose by the Thinker so he could steal their powers. Barry and Iris got married, Barry went to prison for a sec, the team gained a friend in Ralph Dibney, a random excited girl showed up and eventually revealed herself to be Barry and Iris' future daughter, who thinks this house is just bitchin'. Now, she's a bona fide part of the team, even if she's told some confusing stories on why she's come back to visit her fam in the past. In her time, Barry has been missing for 25 years, so she just wanted to get to know her dad, or so she says. Whether there's more to Nora's story she hasn't told us has yet to be seen, but something tells us there definitely is. In case you missed it yesterday, get a little scoop from the cast in the video below, including confirmation that future Iris is coming!